Solutionz by Chicke Fitzgerald : What would you say if I said that it just doesn't matter who is in fact the biggest GDS? What would you say if I said that it just doesn't matter who is in fact the biggest GDS? Consistently, as I look at the statistics on my blog, one of the top blogs is the one where I talk about the biggest GDS (Global Distribution System) company. The three main players are Sabre (based in Dallas), Amadeus (based in Madrid) and Travelport (based in Atlanta with executive offices in the UK). However, yesterday, I wrote about Sabre's IPO and it occurred to me when I was done that size simply doesn't matter. What matters is what the market believes that the company is worth. For the GDS companies that is not only what the public markets think, but what they have been able to get the Private Equity community to invest and what kind of an exit the PE companies can get from taking the company back to the public markets after going private. By all measures, Amadeus is indeed the biggest - the most profitable and is valued the highest by the marketplace. When you look at revenues for the three companies, it is very clear that Amadeus is the biggest based on revenues. 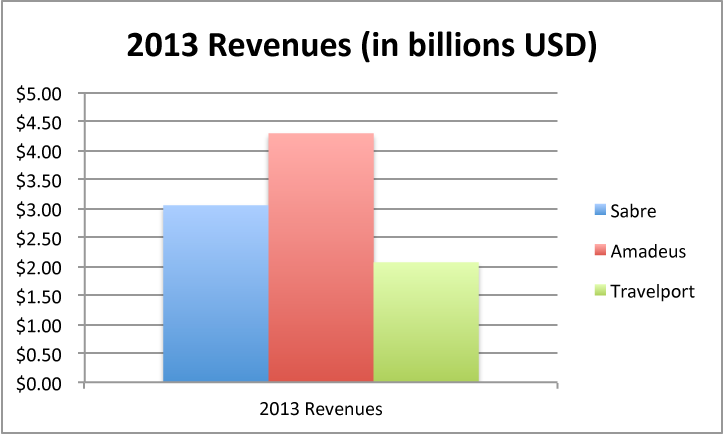 Amadeus' 2013 revenues are $4.29b, Sabre delivered $3.05b and Travelport brought in $2.07b. But what isn't clear from this chart is that Sabre's market cap is not proportional to its revenue share. Amadeus' current market cap is 4x that of Sabre. Travelport's market cap is not available, as the company is still privately held. As I mentioned yesterday, this is Sabre's second pass at the public markets. The first time they raised $545.4m and this week, they yielded just $627m. Sabre was purchased by TPG and Silverlake in 2006 for $4,850m. Amadeus has also taken two passes at the public market. Their first IPO raised $1,230m. Their second IPO has been touted as one of the most successful IPOs in recent history, bringing in $1,700m. BC and Cinven took Amadeus private in 2000 for $5,400m. Travelport's predecessor company Galileo was the second GDS to go public in 1997, yielding $783m. They later raised $4,300m from Blackstone when they went private in 2006. While I didn't mention all of this history in my blog yesterday, it sheds new light on how dismal the results of the Sabre IPO really were. It also occurs to me that it is time for a GDS Pedigree Series for those of you that have not been following these companies since their birth in 1978. Tomorrow is another day. Stay tuned.